Once you are logged into your online profile, the system will bring you back to the registration questions. If you have “ineligible” next to your name, chances are good that your profile is missing your date of birth. Click on your name and edit your profile to be brought back to the registration questions. Answer the questions and click on submit. This REGISTERS you as a coach which is mandatory for US Lacrosse and insurance purposes. Next, you need to make sure your name appears on your team (Under the Programs/Teams page of the website). By appearing on the Team Page, you will have admin access to your team pages. If you are new, send an email to < > to be added. When your password has been accepted a new button “Administer” appears next to Log Out button. Click on the Send Email button near the top/right of the roster page. This will put you into an email composition mode. To email a smaller subgroup within the team: follow the same steps above, but once you are in the email composition mode just delete out the email addresses in the “To” box that you do not want to receive the message. A submenu appears which lists player names and check boxes to make this easier to do. To email a single player; after logging into the admin area, navigate from the “Administrative Features” page to Members -> Email Members. From the Member Search screen, enter the player’s last name and highlight the team name. This function is only available after the teams have been formed unless you have greater admin access. See Setting up News Bulletin Message below for instructions to post a message on your team’s News Page AND email that message out to the team. This is the BEST way to ensure that your entire team gets information. As a general note: before adding any practices to your schedule, you can check on whether other teams have already scheduled a practice on a given field by clicking on the Master Schedule tab on the website’s home page (left hand column) and check the facility schedule. Under Location find and click on the field that you are playing on. If it is not there, then use “To be determined” field and send an email to to get it added. After logging into the admin features, Menu surf your way to your team’s Roster page…by clicking on the Programs/Teams tab and entering your team’s respective information in the drop down boxes. From the Team’s HOME page, click on “ADD MESSAGE” button on top left of page under your team name. This will put you into a bulletin composition mode. If you only want the message posted on the News page ONLY, then just click Submit. If you also want the message emailed to your team (recommended), as well as posted as a News or Bulletin item, then click on the Email Broadcast: box and make you’re your team name is highlighted before you click on "Submit". Ideally, you want PARENTS to update their own profile information to keep it current. Parents can do this by clicking on the "UPDATE MY ACCOUNT" menu item at the bottom of the Home Page. They need their email address and password to do this. Instructions are on the pages to walk them through the process. 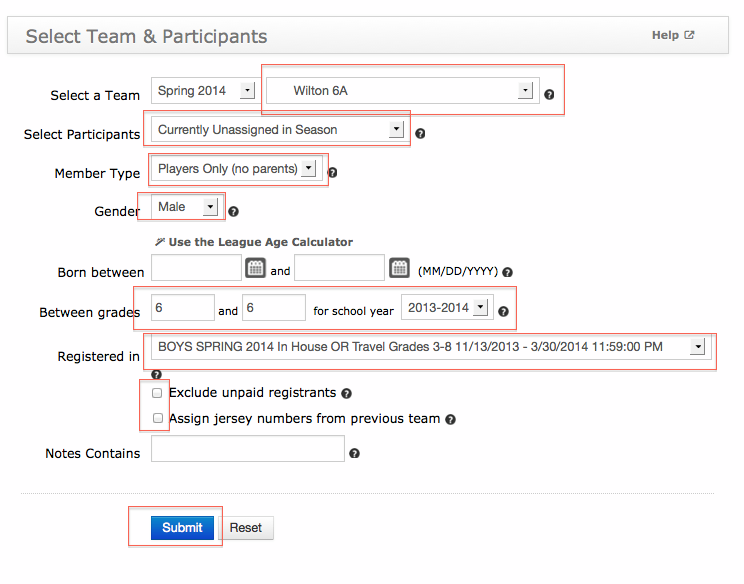 In the event that Parent Input is not available and you as a coach need to update player information. Use the instructions below. Please note that THIS IS AN ADMIN FEATURE AND NOT ALL COACHES HAVE THIS ACCESS. Send an email to if you need admin to make the corrections for you. After logging into the admin features, navigate to your Team then click on the Roster menu in the left hand column. We recommend not posting identifiable photos of children on the web site, unless you have permission from the parent. Do not include a player's full name in the photo caption or post a photo where a nameplate is visible. It is the responsibility of the HOME team to post game scores as quickly after the game as is possible. Go to the game listing and enter the score next to each of the teams. Note: you must have Board Member or League Director admin access to download registration information. It is assumed that NO downloads will be sent to ANYONE else or used beyond the Wilton Lacrosse Season for which the team information is needed. Breeches will ensure that your password is removed forever. Currently Registered in Programs: highlight the registration program that the players will have registered in. AFTER teams have been set up, downloads are generally not necessary as player information can be seen from the TEAM page (navigate to the team using the three drop down menus under "Programs/Teams" tab along top of screen. Coach access gives access to player details and ability to email players and post bulletin messages on the team pages. ANSWER: How do I add Jersey Numbers to my Roster of Players? from the next screen, just click on the Submit Button. Then when you see your roster, click on the Save Roster button. Here is the screen where you will put in Jersey Number. Please don't add new positions. All your players are just players. When you are done entering Jersey Numbers (don't add jersey numbers to coaches and team parents----leave them be), Then you will click on SUBMIT. Go back to your roster and you will see that your players now have Jersey Numbers and they are now sorted by Jersey Number. As always, if you find these instructions confusing or beyond your scope, please contact admin for help.